Really short and sweet tonight as t' internet is broke.and I'm having to use my phone. Really tasty and quick lunch from Thomasina Miers. Am completely in love with her latest book to the point that I suggested a Mexican night to the hubby. Silly idea! Unfortunately, this was just a quick lunch so I didn't have the time to make my own tacos - although will definitely give that a try with one of the other filling suggestions another day. 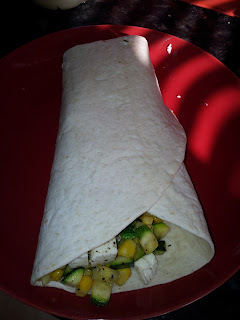 But this was a really good way to use up left over flour tortillas with a bunch of fridge staples - corn, courgettes, shallots, feta and lime juice. A real taste of summer. Heat a heavy-bottomed frying pan and add the oil. When it's hot, add the shallots, garlic, corn, chilli and courgettes. Fry, stirring all the time, until the vegetables are gently coloured on all sides and the onion is translucent. Stir in the herbs, squeeze over the limes and season to taste.